Got my printer set up today! Got my (new-by-ebay) printer set up today. 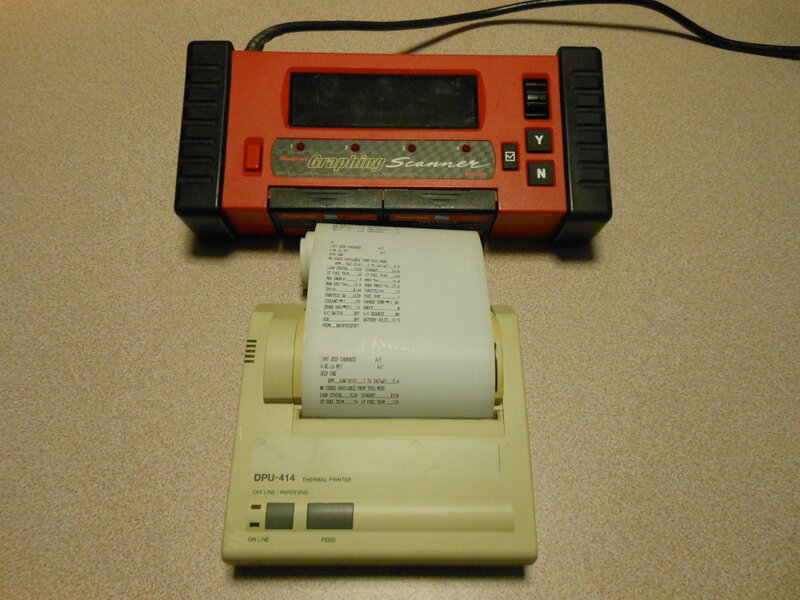 More of a toy to go along with a vintage scanner (Snap On MTG2500), than a necessity. But kind of fun. Last edited by Jeepwalker; 01-11-2019 at 05:55 PM. Nothing wrong with that. I would have gotten one too. Just because. Just out of curiosity what do you think of the "Brick"? I know a lot of guys did not like that scanner but you can pick them up dirt cheap. Well, the scanner works great as a legacy device on legacy vehicles, and I think one has to approach it in that manner. About the newest a guy can take one of these units is 2006. My cartridges will do up to 05 vehicles. I have a lot of older pre-obd II vehicles, including a couple 81 GM's with the computer controlled carb. I often hook it up to my wife's 03 Overland when needed and it'll read mfgr specific engine, transmission, ABS, and I think a couple other modules (if ya use the proper 'key'). I use it on my Jetta TDI too (again with the right 'key'). Once you get past the early 00's it would be better to get the next Snap-On version, the Solus or Verus Pro, they're a leap forward in usability, larger screen, better graphing, ....and more features required for newer vehicles. By the 00's the MT2500's had reached about as far as they were ever designed for technology-wise, and sometimes the MTG's will lock up. It's not often. If all someone wanted to do was read their 80's early 90's jeep ECU to overcome a specific problem then forget it, one of those new Jeep fan controllers would be a better investment, or maybe an Ultra Gauge or another device for later XJ's. But, if a guy had a few 80's-90's cars, or knew they were going to own a range of jeeps for a while, then the 'brick' could be worthwhile. If you were getting into it now, I might consider a Solus Pro or Verus Pro which could also do newer vehicles (just ensure the software level before ya buy), and had more capability than the MT2500. I personally like using the brick. It's like Tinker Toys ...with all the various pieces ..and I get the genuine vintage experience every time I use it. Snap on really did a fantastic job designing it, you hold it with two hands ..rubber on each end, and the thumb roller and two buttons -- brilliantly simple for it's day! Like I say, very tactile. But if you just want a scanner to get over a problem, it can be a PITA to use with all the cartridges, keys, cables and so on. All confusing at first, but that's how technology was. That's why I bought the printer too (more vintage experience). I'm not technology-challenged so to me it's easy to understand. I'm also the kind of guy who likes reading through older factory service and emissions manuals too. I like the MTG2500 (graphing) version because it has a slightly larger multi-color backlit display. Esp the backlit display because I seem to do more in the evenings or even night. The graphing portion isn't highly usable, but it's there just in case. I've really never *needed* to use the graphing capability. With such a small screen, it's hard to tease out the resolution. And the kind of persnickity problems where a guy would *need* it are relatively few and far between on a lot of early cars. But it might have it's place. 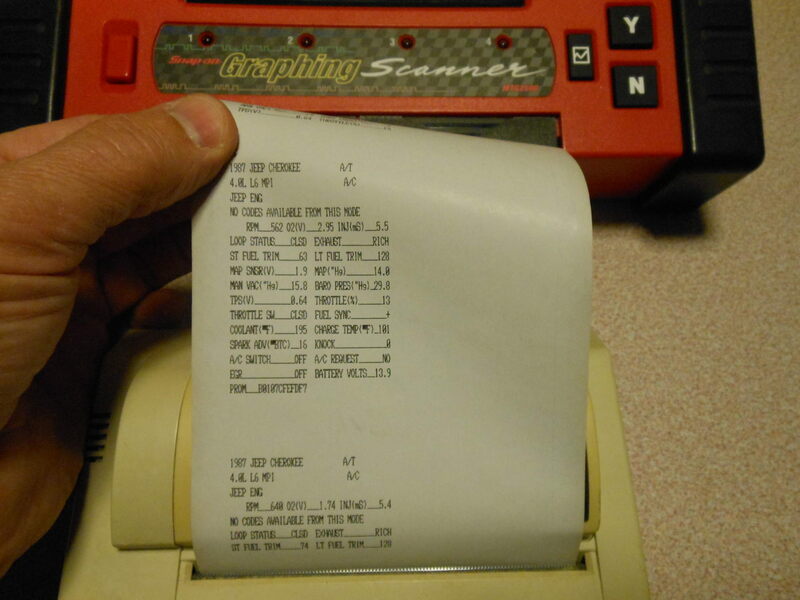 The Troubleshooter component is the magic of Snap on Scanners that nobody else can match. Basically it tells ya what the codes mean, and usual probable causes per each vehicle and specific issues, often down to very specific connectors or grounds, or other items to inspect. There's a driveability troubleshooter too. Few people explore it, and I haven't seen any good youtube videos about it (other than the Snap-on promotional video). But sometimes there is good info in the Troubleshooter if ya take time to explore it. At the end of the day, a scanner is a helpful tool but the vast majority of problems on Jeeps and older vehicles can be ID'd w/o using any scanner. Bad vacuum lines, burnt wires, gummed up throttle body, low fuel pressure, comprise most of the problems which can be zereo'd in better using yer eyes, vacuum/fuel pressure gauges ...and a multi-meter. The magic of any real-time scanner is to collect a lot of data at once. But that alone is not going to fix yer vehicle, and can even lead a person down stray paths w/o adding basic troubleshooting. If a person enjoys tactile older technology, like older video game, vinyl records ..and so on, the MT2500 is fun to use and definitely works great. They're affordable too. For just one pre-obd II Jeep, all you'd need would be a scanner, older cartridges (again cheap), the cable and specific connector (no keys or anything else). That's it. 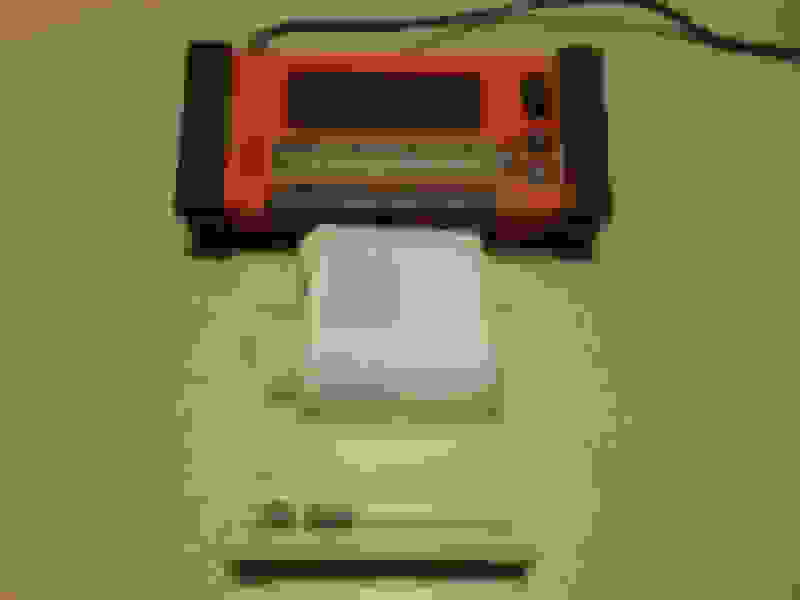 But, if a person wants quick and modern tech, for a variety of vehicles, don't want to fuss with cables, connectors, keys and old-school tech, they'd be much wiser spending more money for a Veris Pro or using some of the other devices out there with blue-tooth and wifi capabilities. Or something like an OBDII Ultra Gauge. The newer Snap On scanners are backward compatible with most pre-obd vehicles and do more on newer vehicles. The MT2500's are really a niche product these days. I hope that helps more than confuses. Last edited by Jeepwalker; 01-12-2019 at 01:56 PM. Might make me pick up one to play with. Just have to research it cause I have to figure when buying something like this with all the peripherals you want to make sure you have everything you are supposed. -Scanner (MT2500 or MTG2500 (graphing, somewhat larger screen, backlit) The graphing scanners usually cost a lot more. -Cartridges: Primary (at least the age of your vehicle or later), Troubleshooting cartridge isn't required, but nice. Best to buy in pairs. If only pre-obdII Jeep, then older cartridges that are less expensive will work fine. -If you want to work on later pre OBDII vehicles you need later cartridges and cable adapters that fit other manufacturer specific pre-obdII connectors (Ford, GM, Imports, Euro). And an OBDII cable adapter (for OBDII vehicles). You can read general codes, but certain vehicles need key's to read manufacturer specific codes. Books aren't really necessary, but nice if you really get into it. There's enough on youtube to learn how to use. The scanner is powered through the vehicle when plugged into the Renix or OBDII plug. Some vehicles (early GM's) requires external power from the cigarette lighter ..so you'd need a cigarette lighter (or car battery) power plug for them. -Best and cheapest to buy a whole kit off like ebay or C/L that has several adapters, etc. Last edited by Jeepwalker; 01-12-2019 at 10:14 PM. Heater blower fan decided to crap out today!?! TODAY!!?!? Brand new set of 31's on set of Jeep WJ Silverblades for trade. Returning to stock. Quick Reply: Got my printer set up today!